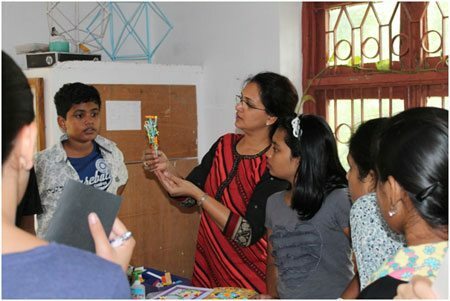 The students of The Peepal Grove School, an alternative boarding school in india had the rare opportunity to venture into the entrancing world of quilling thanks to Mrs. Shri Jadeja, a quilling expert from Bangalore, who also happens to be the mother of two of the school’s students, Maithilee and Agasthya Jadeja. Quilling is a paper craft, originally from Australia, which involves coiling of thin paper strips with the help of a simple tool. Well, it is as simple as it sounds, but the results can be breathtaking. Mrs Shri Jadeja in Peepal GroveMrs. Jadeja conducted a 3-day workshop, preceded by a brief presentation to give an idea of what was in store for the students. On the first day of the workshop, the students were introduced to the basic units of quilling – coils and scrolls. Dozens of different kinds of coils and scrolls were exhibited from which the students could choose their favorites to try out. In the next two days, the students came up with their own quilling projects and worked on them meticulously. They created a wide range of projects, the common ones being earrings, greeting cards, tags, floral designs and snowflakes. Quilling in Peepal GroveMrs. Jadeja who has been into quilling for more than two years now, says that she enjoyed the international boarding school atmosphere at the school. While there are established shapes and techniques in quilling, Mrs. Jadeja constantly innovates new techniques and keeps herself updated with the latest products in the market. Her toolkit consists of many things one never knew existed. Apart from scrolls and coils, she does paper craft using many techniques such as combing, pinning, honeycombing and fringing, some of which she has created yourself. She was kind enough to readily share with the students some of her own techniques which were born out of her quest for more.